The chairs were originally used in the guest rooms of the Hawaii Prince Hotel Waikiki. “The HHSC Oahu region is grateful to the Hawaii Prince Hotel Waikiki for responding to our request for donations that will, in turn, enhance our revitalization goals during these challenging financial periods,” noted Vincent S.H. Lee, HHSC Oahu region chief executive officer. The HHSC Oahu region is comprised of two nursing-homes (i.e., Leahi Hospital and Maluhia), in addition to one non-profit health care provider (Kahuku Medical Center) who care for all regardless of their patient’s ability to pay. 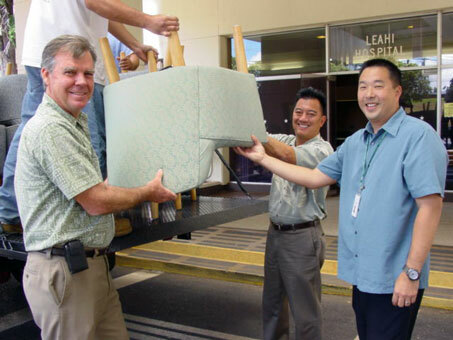 Leahi Hospital and Maluhia provide a range of long-term care services, including twenty-four hour skilled nursing, physical therapy, occupational therapy, speech therapy, assistance with activities of daily living, adult day health, and geriatric. Located at the entrance to Waikiki, the Hawaii Prince Hotel Waikiki and Golf Club is appointed with all oceanfront accommodations and world-class service at one of Oahu’s most desirable and convenient locations. Prince Resorts Hawaii, Inc. operates three hotels in Hawaii: Hawaii Prince Hotel Waikiki, Hapuna Beach Prince Hotel and Mauna Kea Beach Hotel. The company also operates three golf courses: Hawaii Prince Golf Club, Hapuna Golf Course and Mauna Kea Golf Course. HHSC is the fourth largest public health system in the country and the largest provider of healthcare in the Islands. HHSC is comprised of 12 public hospitals, in addition to two non-profit affiliate providers who care for all regardless of their patient’s ability to pay. We provide a range of services, including emergency, specialized disease management, primary care, rural care, long-term care, home health and adult day-health – all of which improve the health of individuals and promote the economic health of our island communities throughout the state of Hawaii.